"The One Man Pantheon's amazing superhero fiction"
Professor Quentin Alexander is Godling, the One Man Pantheon. He's given the power to change into this superhero, able to channel the powers of the Greek gods. He uses these powers to protect New Troy City and create awareness about the Olympians, which should increase their influence on our world again. Perfect for fans of fast-paced superhero action and served up in exciting issues, rather than chapters. Godling has not been tagged yet. 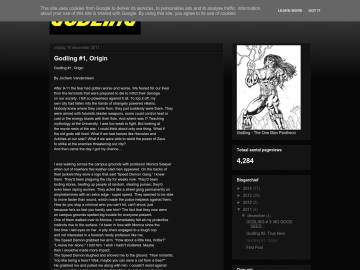 Help others find Godling by tagging it! Godling has not been reviewed yet. Godling has not been recommended yet.